An adept and satisfying puzzle game with a narrative that requires a bit of player investment to yield its biggest rewards. What is it? 3D logic puzzler with a philosophical bent. I can't tell you with any certainty what it really means to be a person. I can tell you, with a little more authority, what it is like to be a person who arranges blocks, fans and lasers to solve puzzles under the eye of an omnipresent intelligence. You materialise in a maze styled after Greek myth; urged to collect Tetris pieces to assemble keys and unlock new pathways, you solve building-sized puzzles using a set of logical tools that interact with each other in increasingly complex ways. You do so with the encouragement of an unseen voice, identifying itself as god, possibly an AI, and you piece together the truth of the world by reading, paying attention to your surroundings, and unlocking secret areas. The Talos Principle is unlikely to be the first time you've encountered this structure for a puzzle game. It's Portal, in essence, or Quantum Conundrum. Likewise, a decent number of its game systems arrive from elsewhere: redirectable energy beams courtesy of Portal 2, recording and replaying past actions a la Braid, stackable boxes and pressure plates via a million other places. Novelty is not the game's strength. What makes The Talos Principle valuable is the comprehensive skill with which these pieces are assembled. The forgivingly low bar set by its initial puzzles belies the complexity of what follows, and the majority of chambers are flat-out excellent: a feat made more impressive by the sheer number of the things. You're looking at a running time of ten to fifteen hours to do absolutely everything, assuming that you don't smack up against the ceiling of your own acuity. The difficulty curve is expertly set. Once you've got your head around how a new tool works, many puzzles can be cracked with less than a minute's consideration. It's the optional set—denoted by a red Tetris piece—that raise the stakes. One or two of these stumped me for half an hour or more, and beating them made me feel like Dr. Smartman, Professor of Being Smart at I'm-The-Best University. That feeling is a substantial part of why these games are appealing, and The Talos Principle delivers. Graphics options Field of view (60-120), graphics API, V-sync, triple buffering, CPU speed, GPU speed, GPU memory, colour options, letterboxing aspect ratio, HUD scale. The Talos Principle gives you an impressive amount of control over how the game looks and feels. You can switch to a third person view, alter the aspect ration, and even alter the colour balance and contrast of the game through a series of filters. Framerate is uncapped and I achieved around 90fps on average with everything turned up to max. That's the pure game part. 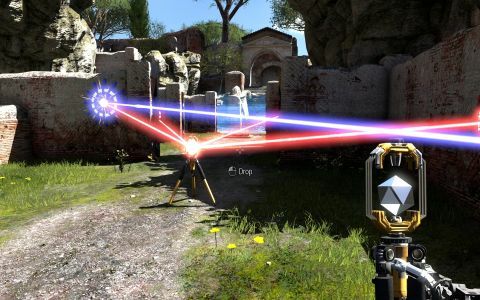 The other half of The Talos Principle is found in its loftier ideas. Considerations about the meaning of personhood, apocalypse, machine intelligence and the ramifications of the Biblical Fall of man are spun through the game via text-dispensing terminals. There is a surprisingly intricate story being told, here, and its substance is only gestured at by that booming voice in the heavens. Its meat is in logs, excerpts, e-mails and interactive conversations that you extract from DOS prompts, records that touch on everything from the day-to-day running of a scientific facility to literature and, particularly, philosophy. It's cleverly written stuff, varied and interesting. It is, however, an extension of—rather than relief from—The Talos Principle's demand on your brainspace. Other games of this type use narrative to provide a break from the rigours of problem solving. Here, all that written material (and there's a lot of it) is another type of puzzle, less strictly logical than the challenge chambers and more concerned with ideas. The game is a thought experiment, of a kind, and you've got to be willing to engage with some heavygoing backmatter to get the most out of it. It's well worth engaging with, in my view, but I'd forgive you for not wanting to pause to parse twenty lines of computer-corrupted Paradise Lost having just exhausted your faculties rearranging lasers. I'm fascinated by The Talos Principle's lack of visual artistic direction. This landscape of remixed Greek, Egyptian and medieval styles is technically accomplished but says absolutely nothing: a sense compounded by the fact that the developers let you fiddle with colour filters from the main menu. More than anything else it reminds me of those benchmarking demos that used to ship with 3DFX cards in the late '90s—depopulated ruins presented for their complexity only, any human point of reference secondary to some mechanical process churning away beneath the surface. In another game I'd write that line off as overthink. Chances are, nine times out of ten, that art that says nothing was trying to say something and failed. I don't think that's true for The Talos Principle. If any game was going to look like a Voodoo 5's fever dream on purpose it'd be the one with a wide-ranging interest in machine-generated worlds, artificial intelligence, and the way that personality imprints itself on nothingness. The game is clever enough to pull something like that off, and generous enough in its puzzle design to make you feel clever into the bargain. If you're actually a person, that is. There's still some doubt on that front.